F'n Colleen's 8 song CD "Hi We're a Band"
CD Produced and Engineered by Ron Sutfin and Featuring Deb Sutfin on vocals. F'N Colleen "I'm Fine" MP3 Free Download!!! The CD was released in March of 1996 at a record release party at the "Gypcy Bar" at the Yale Graduate School on York Street in New Haven, Ct. The band was formed in 1994 with Nancy Cambino and Colleen Cusack on guitars and Jef "Mookie" Wilson on bass, with Kerry Miller taking over on bass shortly after. Jeff "Baby Huey" Wiederschall and Kathy Evans also filled in at the bass position. 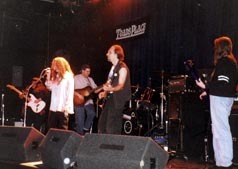 Chris Arnott of The New Haven Advocate described the band as "a cross between Hole and The Jefferson Airplane". Fran Fried of The New Haven Register wrote "the band has the energy of early U2 but it's mostly their own trip, with a strong sound and decent hooks". In May of 1996 the band played the Carling/Beamish "Uncorked Music Festival" in Cork Ireland and also played at Eamonn Doran's in the Temple Bar section of Dublin. 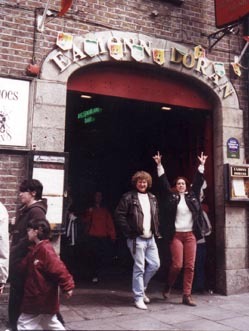 Aileen O'Reilly of The Dublin Evening Herald wrote "The raggle-taggle bunch are going down and absolute twister and packing out venues" This photo is Ron and Deb in front of Eamonn Doran's Club. Dermott Doran, the son of Eamonn Doran and manager of the club, treated the band very well and was bumming "Clove" cigarettes off Deb. Deb took this photo of the crowd at our show on the St. Patrick Street stage at the Carling UnCorked Festival in Cork Ireland. The 3 day music festival was a huge success according to Carling/Beamish marketing director Brendon Caughlin with over 100,000 people flocking to the city to party and see the different bands. This photo is from the world famous "Toads Place" nightclub in New Haven. F'n Colleen music video of the song "Waiting". Shot in 1996 by Dennis Peters from Heavy Bag Media and edited by Ron Sutfin, some of the scene were shot at Holy Land in Waterbury Ct.